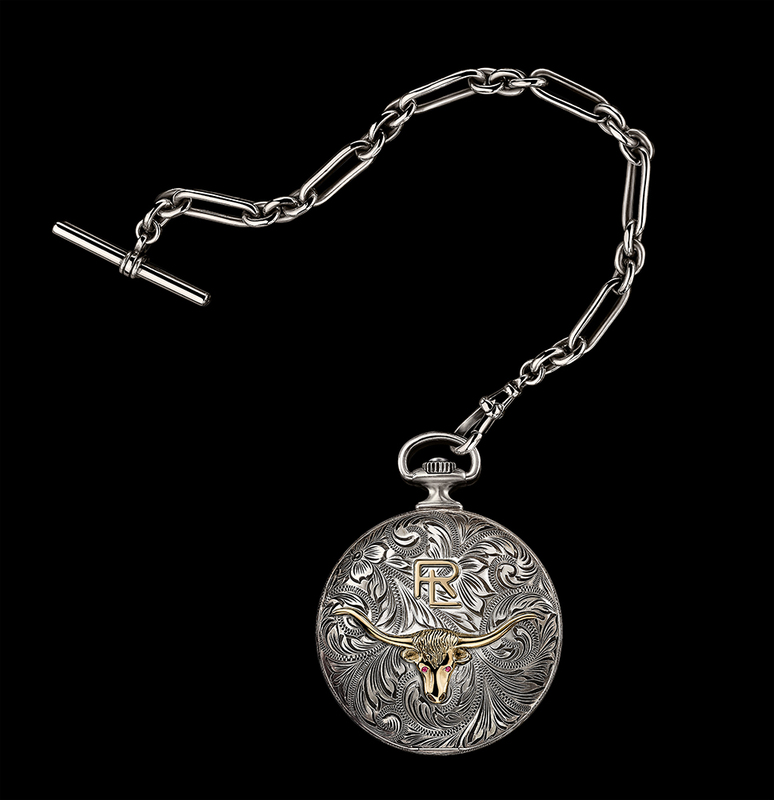 Ralph Lauren American Western collection pocket watch in sterling silver. Ralph Lauren, who this year celebrates the 50th anniversary of his iconic brand, unveils a very exclusive new watch collection geared for lovers of fine Swiss mechanics and incredible American western style: Ralph Lauren American Western Watch collection. With retail prices ranging for $24,000 to $58,000, the collection is pretty much going to be tailor made in very small batches. 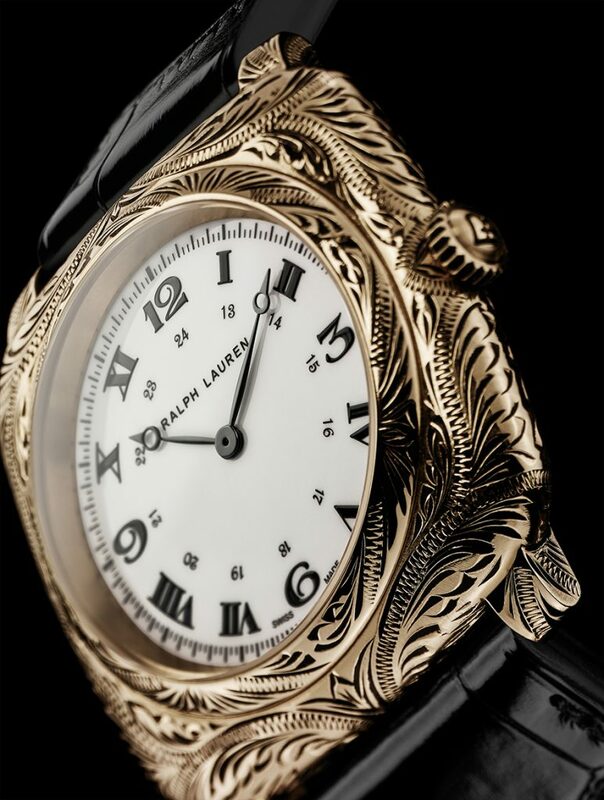 Every watch features detailed engraving on the case, bezel, caseback and buckle — all done by hand in New York City — making each watch a unique piece of art for the wrist. It takes one artisan nearly four days to engrave just one timepiece. Additionally, theRalph Lauren American Western Watch collection watches are finished with a superb leather strap, made in Texas, that features a coordinated western motif design that is hand-tooled. The strap is then later burnished in Italy. In a separate article on my Perfect Timing column on Forbes.com,I go into detail about Ralph Lauren’s 50th anniversary, and the making of this series. Here, we cut to the nitty gritty details about the timepieces that recall Ralph Lauren’s deep love of the American west. There are several silhouettes being offered, including a 42mm vintage 1930’s/’40’s-inspired cushion-shaped case, and a classic 45.8mm round case. Each is created in either antiqued 18-karat rose gold or antiqued sterling silver, and each is fitted with an interchangeable burnished leather strap. 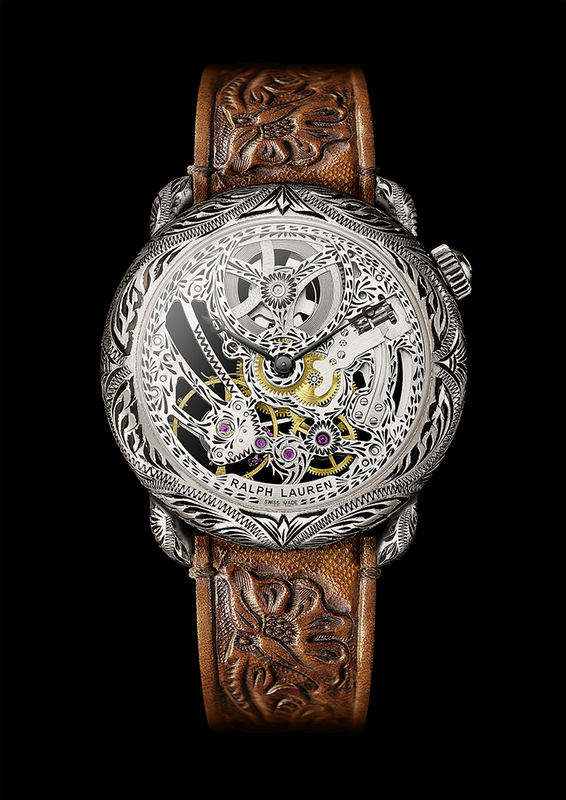 There are also pocket watch and skeletonized versions that are definitely eye catchers. 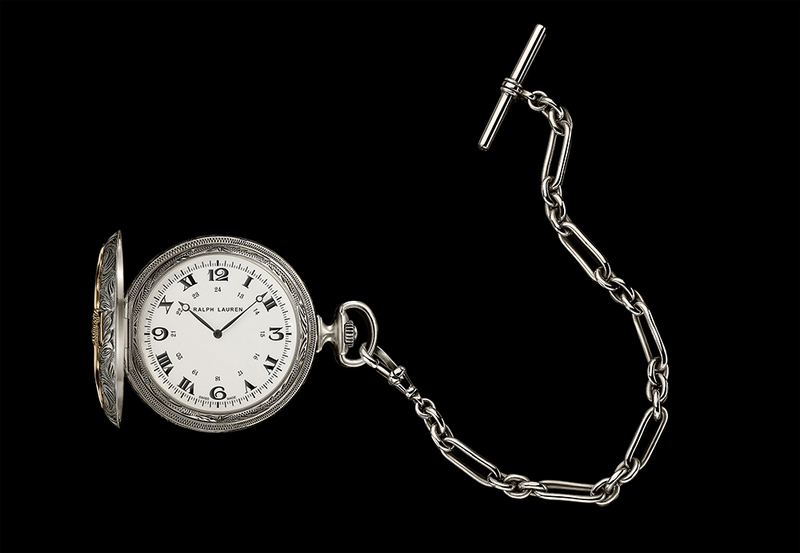 Ralph Lauren American Western collection pocket watch in sterling silver retails for $44,000. Easily the highlight of the western-inspired series is the Ralph Lauren American Western Collection Silver Pocket Watch with Steer-head Cover. The 50mm full-hunter case pocket watch is meticulously engraved with a silver floral motif on the cover and a centered 18-karat rose gold steer-head, with the RL logo above it. Open it up and the case reveals a stunning off-white dial — the exact color of which Ralph Lauren searched a long time to achieve. It features lacquered and polished Roman and Arabic numerals printed in black, along with a minute track. The watch is powered by the mechanical manual-wind RL98295 caliber made by IWC for Ralph Lauren. It offers 45 hours of power reserve. The watch is crafted in 95 grams of sterling silver. It is accompanied by a 24-gram sterling silver chain and weight. It and retails for $44,000. Just 50 pieces will be made. There is also a 50mm Ralph Lauren American Western collection pocket watch crafted in 18-karat rose gold. That timepiece does not feature a hunter case. It does, however, house the same 156-part RL98295 movement made for the brand by IWC. The components feature a vertical Côtes de Genève and perlage (circular graining) finish. 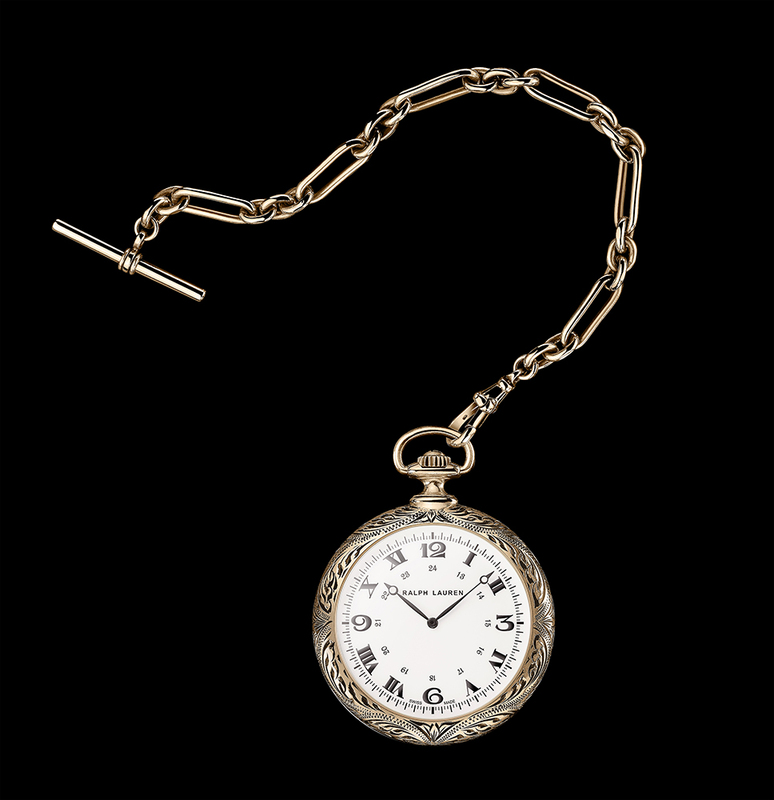 The watch weighs 108 grams and the accompanying gold chain weighs 36 grams. It is the highest-priced piece in the collection at $58,000. Ralph Lauren American Western Collection Cushion watch. Offered in either 18-karat rose gold or in sterling silver, the Ralph Lauren American Western Collection Cushion watch is one of my favorites. The cushion case shape is inspired by the watches of the 1930’s and ’40s and offers individual style. These watches are powered by the self-winding Caliber RL514 made by Piaget for Ralph Lauren. The 189-part movement beats at 21,600 vibrations per hour and offers 40 hours of power reserve. The case measures 42mm x 42mm and is 10.60mm thick. Water resistant to 50 meters, the watch is sold with an interchangeable tooled leather calf strap. 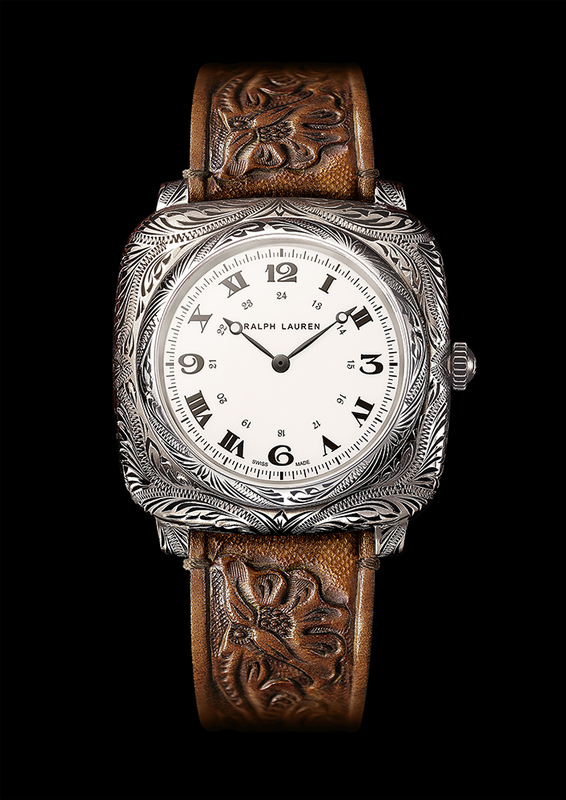 Ralph Lauren American Western Collection Cushion watch in sterling silver. 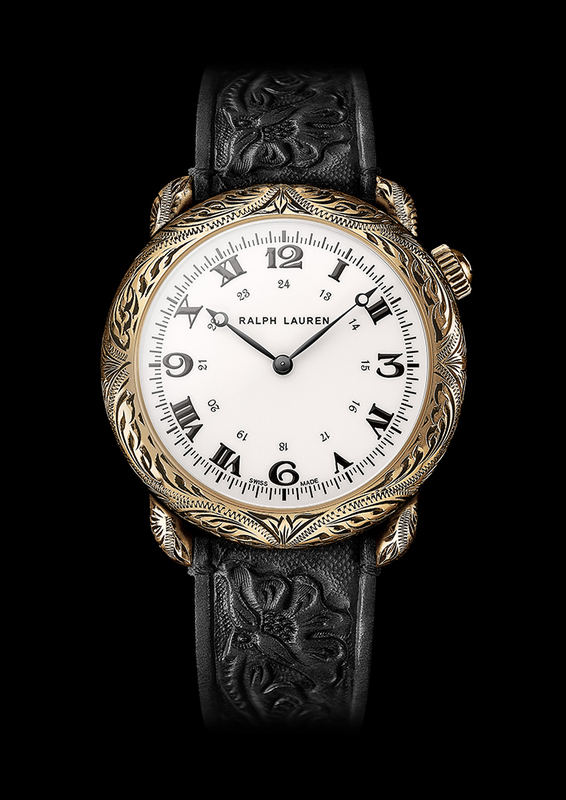 Ralph Lauren Western Collection round watch. Turning to the classic round shape, the Ralph Lauren Western Collection Round watches are also offered in rose gold or in sterling silver. The 45mm watches are powered by the mechanical self-winding RL514 made by Piaget for Ralph Lauren, as in the Cushion shaped model. They are water resistant to 50 meters. Ralph Lauren Western Collection round Skeleton watch. Also in the round model, Ralph Lauren unveils a pretty elaborate Western Skeleton watch. The Swiss-made caliber RL1967 Is an open-worked, hand-wound mechanical movement that originally presented in the RL Automotive Collection. This new Skeleton brings together the graceful power of intricate mechanics with the beauty of Western design, a tribute to Ralph Lauren’s passion for time-honored Americana and Swiss precision. With 156 parts and 45 hours of power reserve, the watch is easily an eye-catcher.